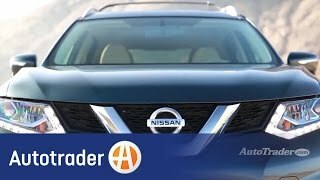 This is AutoAcademics' video review of the 2015 Nissan Rogue SV. Our particular tester included the SV Family Package that offers more space for larger families. Contact www.autoacademics.net for more info or to schedule a test drive near you. LIKE us on Facebook, FOLLOW us on Twitter, and by all means SUBSCRIBE to our YouTube channel. Thanks! Thanks for the review. I am heavily considering a pre-owned 2015 SV with the family package. All though the space is tight, it will work with my kids and their friends. I am a bit spooked about the run-flat tires and there being no spare. Are my concerns justified? Hi, Matt. Runflat tires have been around for quite some time now and are becoming more standard as manufacturers look for ways to save weight. That being said, you shouldn't worry too much about them as they're made on the same principal as a spare. You only use it to get you out of trouble and to a place where you can get it replaced -- just like a spare donut (tire). They're not as good as a full size spare, but a crossover like the Rogue wouldn't have one of those either. Hope this helps and thanks for watching! There IS storage for a spare tire, but the documentation for it is practically non-existent. Here's the only tutorial I've found. Well, Carlos Pagan, while they both are available with 3rd row seating, the Pathfinder is larger than the Rogue, making its 3rd row more usable for adults. Both vehicles have been updated for 2017 with stylish front ends. 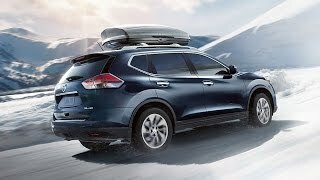 The 2017 Pathfinder has a new more powerful 3.5L V6 engine, a motion-activated liftgate, and new driver assistance tech. The 2017 Rogue has the new liftgate, as well, new Safety Shield tech, and will offer a hybrid version, too. 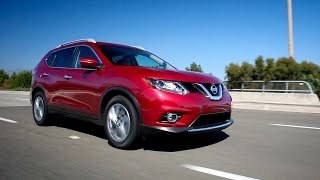 We can assume all versions of the Rogue will offer better fuel economy than the Pathfinder. 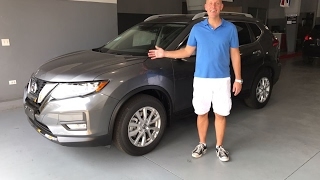 Whether you buy a preowned 2015 model or a new 2017 model, the main thing to think about is what size vehicle will work for you, as that is the primary difference between the two. Hope this helps. We appreciate your comments and thanks for watching! is there a way to tell if the Rouge has the family package when shoping? I'm asking the same question--2 years later. Did you ever get an answer? +Nich Mathews No problem, Nich Mathews. We wish you well with your shopping. Feel free to comment back on here if you get one. We'd love to hear your thoughts. Because it is the SV Family Package, it would have to say SV on the tailgate, however, besides that we don't think there is a way to tell without looking inside, since we believe the spare tire is in the floor of the cargo area on non-Family Package vehicles. You will probably need to check the window sticker to be sure, and if it is pre-owned, open the hatch and physically look for it. Hope this helps, Nich Mathews, and thanks for watching! Awesome job on this video. I just bought a new 16 SL model but this is still a great and entertaining/informative video. Keep up the great work!! Thank you, bhbest. We truly appreciate the kind words. If you feel so inclined, please consider subscribing to our channel. We can use all the help we can get! LOL Enjoy your new car and thanks for watching! Was already subscribed with comments. I am a fan now. +Harry Potter Thank you! You are greatly appreciated. We don't know how we didn't remember a name like Harry Potter. It sounds so familiar. LOL Take care! +Harry Potter Hey, Harry Potter. Thank you very much for the kind words. We truly appreciate them. Please consider subscribing to our YouTube channel. We can use all the help we can get! LOL Either way, however, we appreciate you watching! Seriously the best car review video I've ever seen! Thanks! +Stephanie Quintini Stephanie Quintini, you're making us blush! LOL In all seriousness, we appreciate your kind words. On a side note, if you haven't done so already, please consider subscribing to our channel. We can use all the help we can get! Thank you again for sharing and for watching, too! My wife is shopping for a mid-size/compact suv. Although we have 4 kids we just don't go that many places where we need 7 passenger seating in a monstrous 50k SUV. 99% of the driving will be to/from work. But for the occasional family get together the option of a 3rd row is immense. 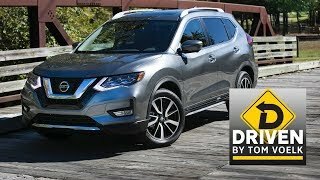 I never considered a Nissan until I saw this family pkg feature in the Rogue today. +jjs777fzr Thank you for sharing, jjs777fzr. We wish you well with your new purchase and thank you for the kind words. Until next time! +AutoAcademics after thoroughly looking over the Rogue we ended up going for the 2016 Dodge Journey Crossroad AWD. It offered a little more space than the Rogue w/3rd row etc. It's the last year for the Journey as they reintroduce the new from ground up Pacifica. If my family were smaller we'd have a Rogue. The Pathfinder is pricier than the Journey when fully optioned out. Keep up the great work on video reviews. +jjs777fzr We're happy we could help, jjs777fzr. We were rather surprised when we found out about the Family Package, too. 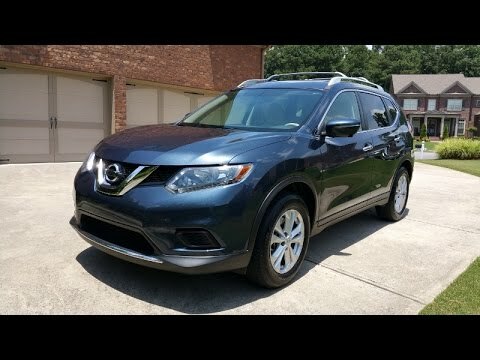 The Rogue is a nice vehicle, and while the 3rd row does not work very well for adults, it would work just fine for smaller children who can get in and out of that row independently, minimizing the need for an adult to climb back there. The 2nd row works great for everyone else - kids in car seats or adults - making this a viable choice for the right demographic. We appreciate your comments, jjs777fzr. Feel free to comment back on here if you get one. We'd love to hear your impressions. Thanks for watching! My uncle got a brand new Nissan Pathfinder S for $23k out the door. Question: What are differences between Rogue SV and Select? +FlipnotePikachu FlipnotePikachu, thank you for sharing. 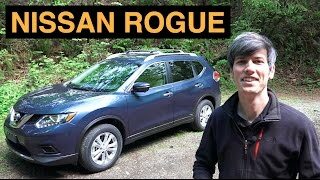 We hadn't even realized that the 2015 Rogue Select was basically the previous-gen Rogue. The S trim is the only trim available on the Select model and you can add a Convenience package or an Appearance and Convenience package to it. We appreciate you bringing this to our attention, FlipnotePikachu. We may have to add you to our payroll. And by payroll, we mean Twizzler rations. LOL Thanks again! 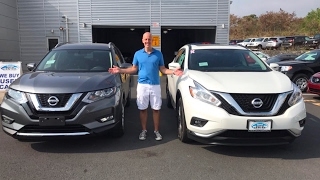 The real difference between the Nissan Rogue Select and the Nissan Rogue SV is huge. The select has limited features while using the old body for it too. 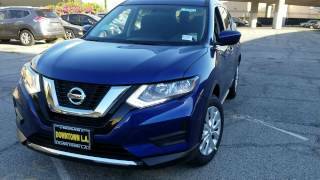 It is also cheaper than the Nissan Rogue S compared to the Select. S does not stand for Select by the way! The SV has a whole lot more features like the one you saw on the video. However, the costs of the vehicle is a lot more than the select model. If you are looking for a lower priced SUV with AWD available cheap and want to use it from point A to point B no problem, get the Select. If you want to amp it up with some features that he has shown INCLUDING a push to start button, get the SV. +Bill Willard Hi Bill Willard. While the Rogue S (Select) is the base model, it comes decently appointed with LED daytime running lights and rearview monitor, as well as offers a few optional features such as power side mirrors and roof rails that are standard on the SV trim. 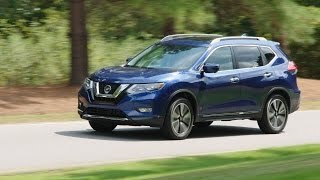 The mid-level SV trim can also be optioned with a moonroof, Nissan Connect w/ Navigation, and an around view camera. Plus, we mustn't forget the SV Family Package (3rd row). 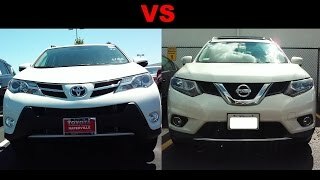 You can compare more similarities and differences at www.nissanusa.com. Hope this helps and thanks for watching! Where does the car carry the spare tired? +atila540 Hi atila540. 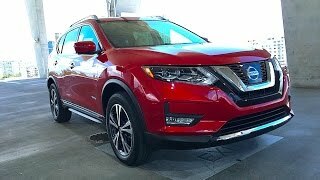 The 2015 Nissan Rogue that we tested had the optional "SV Family Package" that adds the third row seating, but eliminates the spare tire. The vehicle is equipped with run-flat tires instead. These tires have reinforced sidewalls so that you can continue to drive the vehicle for a certain amount of miles to get the tire replaced. Hopefully this answers your question and thanks for watching! +Andy T Thank you, Andy T for the kind words and we're glad we could help. If you come across anyone else who is looking for information about cars, please direct them to our YouTube channel. Good luck on your purchase and thanks for watching! 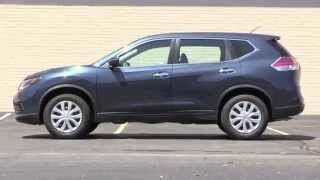 Another "Great" review of the 2015 Nissan Rogue. I am getting hooked on your detailed reviews and look forward to the next ones. Chris, do you think you would ever have a mid-sized car Shoot-Out in the future. I would love to get your opinion on those popular sized autos. +bhbest Thank you, bhbest. We appreciate your support! This guy does a real nice job demonstrating stuff and keeping your attention,, he really does and does it without boring you! +John L First, thank you for the kind words, John L. We appreciate your support. With regards to the cars, a new Honda Accord is on the very near horizon so we hope to get our hands on one soon. As far as a shootout is concerned, we would love to do something like that, but being that we're still relatively new in this arena of car reviews, we do not have quite enough clout to procure more than one or two of these vehicles at a time. Plus, Chris has already filed a complaint with HR about his limited restroom breaks. Anyway, we'll see what we can do. Take care and thanks again! 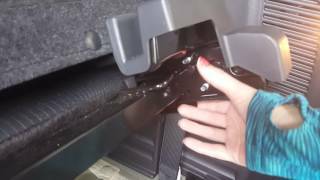 How sensitive is the gas pedal of this Rogue compared to the CR-V that you tested? Which one did you feel getting off the line quicker? +Johnson L If we remember correctly, Johnson L, the CR-V does feel a little more athletic than the Rogue. As you probably saw in this video, we like the handling of the Rogue, but the CR-V felt a little more like an Accord after a big lunch, as opposed to a Pathfinder on a diet. Maybe that's not the correct analogy to use, but that's what seems to be floating through our collaborative heads right now. Not to mention, Chris has reviewed about 8-10 cars this month alone, so he wasn't of much help, and it was past his bedtime when we interrogated him. Our best advice would be to test drive both to gauge for yourself. Tell the dealer that AutoAcademics sent you. Hope this helps and thanks for watching! Really enjoy your reviews. I have to admit, I never really understood the need for a 3rd row seat in a compact CUV. Who fits back there in the 3rd row? I not a minivan person but this vehicle makes a whole lot of sense if someone needs to transport more that 4 people. Keep the videos coming. +Customer C Hi Customer C. We would be very happy to discuss this more with you. Please contact us at www.autoacademics.net. Thank you for watching! 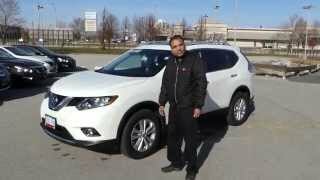 Great review,Let me ask you ,I need a 6 seater vehicle occasionally,bu now I am confused among Santa Fe xl,Dodge Journey and Nissan Rogue,which would be your choice? +Derham43 Thank you, Derham43. We appreciate the kind words. Vehicles like this (ie- small with a 3rd row or any vehicle with a hardly usable 3rd row) look great on paper, almost the same way top speeds do. It's an added feather in the cap, so to speak. 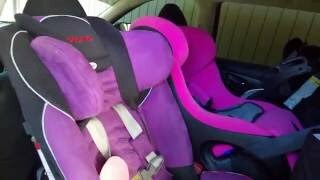 This conversation comes up a lot around the AutoAcademics office and for a crossover like this, it allows for some extra seating either in a pinch or if you have small children/people that are old enough to be out of car seats, yet still small enough (and flexible enough) to fit back there. You should see some of the outtakes of Chris (our host) getting back there. LOL Rather comical. Thanks for watching! 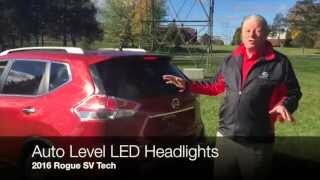 2015 Nissan Rogue SV Walk Around! 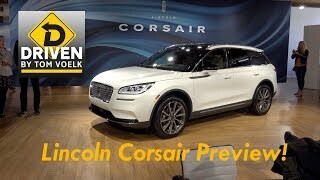 2020 Lincoln Corsair First Look!